TRAVERSE CITY, Mich. and ABU DHABI, Jan. 21 /CSRwire/ - Circle of Blue, the team of award-winning journalists and researchers reporting on water and worldwide resource issues, today launched Choke Point: Index, a dynamic on-the-ground journalism and data project that reveals the globally significant competition between water, food, and energy. The first phase, called “Dry Fields, Dirty Water,” explores three critical, water-challenged agricultural regions in the United States, and was announced during the International Water Summit in Abu Dhabi. The multimedia reports are available online today. 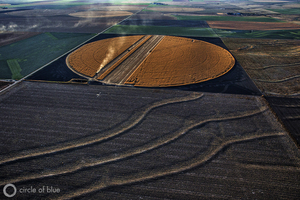 Circle of Blue chose three familiar, and long-studied farming areas in the Great Lakes, Central Plains, and California to develop new facts, and test data-gathering and analysis tools developed for Choke Point: Index. It found the many strengths of the nation’s powerful food producing industry being weakened by an abundance of wounds – aggressive levels of contamination, wasted water, water shortages, energy inefficiency – all of them self-inflicted and the result of production practices that encourage maximum yields and minimal resource conservation. Simultaneously, the United States—especially California—faces ongoing drought that, as it did in 2012, is likely to force power plant closures, cause crop failures, and threaten water-borne transport, while a thirsty energy sector requires rethinking assumptions of water’s value and abundance. Choke Point: Index comes at a key moment in history, when resource challenges are redefining markets and ecosystems globally. For the third consecutive year, reckless use and abuse of water is seen by global authorities as having the potential to seriously disrupt social stability, upend business supply chains, imperil food and energy production, and generally make life miserable for billions of people, according to the World Economic Forum’s annual Global Risks Report published Thursday. The Forum is dedicating unprecedented time to climate, water, sustainability and health issues at its annual meeting in Davos, Switzerland this week. The very same water supply and transport networks that irrigate the nation's grain, fruit, and protein bounty also encourage production practices that cause waste and foul the nation's rivers, lakes, and groundwater supplies. The enormous quantities of fossil energy needed to operate the water works, process the food, and transport it to market contribute to climate change that dries the nation's important food basket regions. The United States’ important food-producing regions are buffeted by the same pollution, scarcity, and water-security deficits that affect China’s Yellow River and Yangtze River basins, India’s Punjab, Australia’s Murray-Darling River Basin, Mexico’s Tehuacán Valley, and other prominent global food baskets. California’s extended drought is further testing the state’s capacity to respond. Though the digital age has made it possible to tap oceans of facts, the tools and standards for collecting and distilling the numbers into recognizable trends are not keeping pace. The trend lines that converge around energy, food, and water are more complex, and more treacherous than they have ever been. They form a nexus of momentous challenges that historically have defied the capacity of human civilizations to solve. Huge amounts of information exist, from satellite imaging to real-time river flows and on-the-ground stories of success and failure. However, mountains of historical and streaming data are largely inaccessible, out of context and still remain stored separately across public, private, and academic institutions around the world. Likewise, many are published online, but in formats that are difficult to use or not connected. Among the principle data gathering and visualization tools, Choke Point: Index is using the latest technologies from Google, particularly Fusion Tables in Google Drive, to bring together and visualize data sets that can be shared openly. Circle of Blue was among the first users of Fusion Tables and participated in its development. More data and crowd-sourcing capabilities will be included in Choke Point: Index. Part of a larger global initiative, the first phase of Choke Point: Index, which includes rich in on-the-ground reportage and imagery, will be followed by data collections and visualizations added this spring. In 2013, Circle of Blue reported from Mongolia, China, the Middle East, South America, the United States and Europe, covering issues that range from water pricing to groundwater stress. Choke Point: Index “Dry Fields, Dirty Water” is Circle of Blue’s most comprehensive report about the confrontation over water supplies in the United States since Choke Pont: U.S., which in 2010 identified water use and potential contamination as the chief impediments to the fracking technology that is allowing energy companies to tap reserves of oil and natural gas from deep layers of carbon-saturated shale. Choke Point: Index is produced with support from the Rockefeller Foundation, Wege Foundation, Alpern Family Foundation, Brookby Foundation and individual donors. Collaborators include the Columbia University Water Center, Earth System Science at the University of California Center for Hydrologic Modeling, Qlikview, and others. Choke Point: Index is developed in parallel with Global Choke Point, a comprehensive international reporting and convening program that explores the ramifications of resource scarcity around the world, produced by Circle of Blue and the China Environment Forum at the Washington-based Wilson Center. Circle of Blue brings the strength of trusted journalism by using its teams of leading journalists, photographers, data experts, field researchers, and designers who report from the front lines of the world’s resource crises, with a core focus on water. In 2012, Circle of Blue received the Rockefeller Foundation’s Centennial Innovation Award for its breakthrough, feedback-loop model that combines on-the-ground reporting, data collection, analysis, design, and convening. Circle of Blue’s reportage is referenced widely. Circle of Blue, based in Traverse City, Mich., is a nonprofit affiliate of the Pacific Institute. For more information, please visit: www.circleofblue.org or follow Circle of Blue on Twitter: @circleofblue.